Pity UK Prime Minister, David Cameron. He’s a toff with tummy trouble. Dressed in white tie giving his annual speech at the Lord Mayor’s Banquet in the Guildhall in London, the midriff studs popped off his dress shirt. Untrimmed tummy exposed to a photographer’s lens, his embarrassment was quickly posted on the internet. As wardrobe malfunctions go, it hardly compares with Janet Jackson at the Super Bowl. However it did spark a debate in the UK media about sartorial etiquette. At least Cameron made the effort to dress properly, the Conservative Party-supporting Daily Telegraph newspaper chimed. It’s the tie-less creative class that deserve a dressing down for dressing down, it opined, pointing to the newly appointed acting director-general of the BBC, Tim Davie, who turned up for his first day of work – shock, horror – tieless. Too many of us these days are letting our appearance standards slip, Iain Martin of the Daily Telegraph continued; not because of tradition but because we’re not meeting the expectations and norms demanded by others. ‘At it issue, is not what the wearer wants. What matters are his customers, colleagues or voters. Millions of Britons, those who don’t work in the media, and the many older people who spent decades having to dress properly for work, see it in terms of good manners.’ An editorial in the same newspaper accepted that improper dress is not a fashion crime but is demeaning to the role: ‘To wear a suit and tie means readiness to do business,’ it explained. Remarkably, Tim Davie subsequently apologised for tie-less first day in the office, saying that he looked ‘silly’ without one. This admission is strange. Richard Florida, chief eulogist of the creative class, claims that creative workers demand dress autonomy in order to be able to express themselves rather than conform to old economy expectations and norms. Moreover the creative class are offered as the vanguard of future work: what they do today in the workplace, we will all be doing tomorrow, it is claimed. So why in the twenty-first century why do we hang on to suits and ties (and dress suits for women); even have prescribed dress codes at all? Working with my colleague Dennis Nickson in Glasgow, I’ve been developing a typology of dress codes as part of our research into aesthetic labour. As we’ve noted in an article in Gender, Work & Organisation on the sexualisation of labour, aesthetic labour is manifest in organisational prescription of employees’ comportment, language and dress. However to say that all dress is just presentational – all style and no substance – would be wrong. Employee dress or what we prefer to call ‘workwear’ can have varied functions, from the presentational to the practical. It can also be prescribed by government, the occupation and individuals as well as organisations. When government prescribes workwear it typically does so for occupational health and safety or hygiene reasons. Hard hats have to be worn on construction sites for example, or hair or beards have to be covered in food processing areas. The purpose is to protect workers’ and/or consumers’ health and well-being. Occupations can have formally and informally prescribed dress codes, usually to communicate ‘this is who we are; you can tell by what we’re wearing’. Gowns and in some cases wigs are worn by judges and sometimes lawyers in US, UK and Australian courts for example. Doing so is a requirement for addressing the court. Outside court, lawyers wear dark pinstripe suits, though there is no formal requirement to do so, it’s just an occupational norm. Other professions also have distinctive informal workwear. When he went in search of Middle England, Stuart Maconie observed a summer ‘uniform’ amongst Oxford academics of crumpled cream jacket and Panama hat, ‘Smarter perhaps than hoodies and tracksuits and baseball caps, but just as unthinkingly de rigueuer,’ he says. Even sociologists conform to these informal dress codes. In sociology departments they’ll happily wear jeans and loose necked shirt for example, and at all levels of faculty. A casual jacket, usually brown, might distinguish older or more senior faculty. Put sociologists in another environment such as a business school, as often occurs in Europe and Australia, and their dress code can change. At a senior level, in come the shiny black shoes, sober suits (or blazer and chinos) and tailored shirts. And, if you want to be taken really seriously, cufflinks are a must. It’s a form of normative matching. Sociologists wearing a suit means that they too are ready for business. The same impression management occurs when individuals dress to impress when they go for job or promotion interviews. Indeed there is a welter of self-help guides and even organisations dedicated to telling us how to dress at for and at work in order to create the right impression. Women, for example, are schooled on their pantyhose: it’s a must with formal business wear, and neutral colours or black should be worn at all times with business wear. Shoes are ‘sartorial punctuation’ Simon Chilvers states. For men, black or brown shoes should be worn for interviews; flip-flops and deck shoes are out. In short, we are extolled to dress the part if we want to get that job or, these days, keep that job. Realising the importance of appearance, organisations too explicitly dictate the workwear of employees in the form of uniforms and dress codes. When it is prescribed as part of the branding of organisations, this workwear becomes a manifestation of aesthetic labour. Some uniforms are generic ready-to-wear outfits, others can be bespoke, designed especially for the organisation. In addition, employees in fashion retail can often ‘model’ current company stock as a uniform, as Lyn Pettinger has noted. On the other hand, although it sells them, as part of its company dress code, Wal-Mart too has stipulated that its employees shouldn’t wear blue jeans. Such codes can be highly prescriptive: in 2010 bankers UBS introduced a 44-page dress code for its employees. 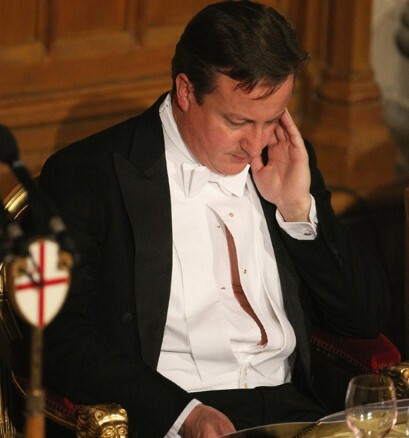 Cameron’s was a wardrobe malfunction not an improper wardrobe. However that he felt it necessary to be wearing white tie as part of his duties in the twenty-first century is intriguing. Clearly we remain social mannequins, dressed in a mixture of government stipulation, occupational norms, individual aspirations and organisational demands. It’s time that we started taking workwear more seriously in our research. It’s important to study what we do at work. Why we do what we do also needs to be studied. So does how we do what we do – and that has to include what we are required to wear as it says something about the nature of that work.